Two and a half months after the Great East Japan Earthquake, a total of 15 journalists from 14 media companies, participated in the press tour to grasp the recovery of the Tohoku region. The participants’ media were from 9 countries/regions:　Australia, Bangladesh, China, France, Germany, Hungary, the ROK, Taiwan, and the UK. The journalists traveled to Sendai by Shinkansen, which had resumed at the end of April, and had an interview with Ms. Emiko Okuyama, mayor of Sendai, leading the recovery of Tohoku. The journalists asked the mayor that what kind of request has been made to the government for simplifying administrative procedures, the psychological state of the people in the disaster-affected area, and the up-to-date situation of distributing the donations to the affected population. 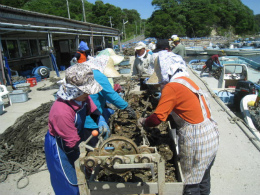 Then the participants visited Matsushima to cover the oyster cultivation, catastrophically damaged from the tsunami, in Higashi-matsushima. Mr. Shigeru Watanabe, head of the oyster department of Naruse Branch, talked about the damage inflicted and steps being taken toward recovery. 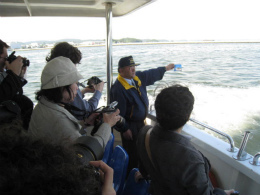 Following his talk, the tour participants were taken to see Matsushima bay from fishing boats. Then, the participants took a boat cruise to Shiogama port, which had resumed its services by the beginning of the annual Golden Week holidays with the slogan, “in our pride of Matsushima, one of the three most scenic spots in Japan.” On the day one-hour guided cruise was conducted by Mr. Akira Ito, President of Matsushima Shima-meguri Kankosen-kigyo Kumiai (Matsushima Association of Cruise Boat Operators). On the boat, he talked about the process of recovery since the quake and the situation of receiving tourists. 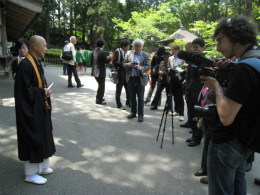 Mr. Ito emphasized the importance of regular disaster drills, which helped to evacuate all the passengers to Zuigan-ji temple, designated a National Treasure, on the day of the earthquake. 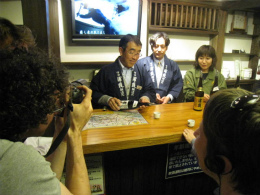 In Shiogama, the participants visited high profile Tohoku-sake “Urakasumi” brewer SAURA Co., Ltd., founded in 1724, in the middle of the Edo period. Mr. Koichi Saura, the 13th president of SAURA Co., Ltd. talked about the disaster-affected sake brewery and the recovery process to resume brewing for this autumn. 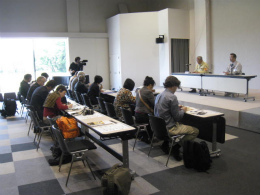 In the Q&A session, the participants asked about the safety of rice, raw material of sake, the impact upon human resource development, and the possibility of claiming compensation from TEPCO (Tokyo Electric Power Co.). On the second day, the participants visited Hiraizumi, which was recommended to be registered as a World Cultural Heritage site in early May by the International Council on Monuments and Sites, an advisory panel to UNESCO. The participants attended a press conference by Mr. Hisaki Miyadate, Vice-Governor of Iwate Prefecture, and Mr. Masayoshi Sugawara, Mayor of Hiraizumi. The Vice-Governor gave a briefing on the damage and recovery process of Iwate prefecture and the significance of Hiraizumi’s registration as a World Cultural Heritage site under the current circumstances. The journalists asked the Vice-Governor what kind of requests had been made to the government, including the deregulation, and how to pass on people’s local pride in the aging society. The journalists also asked the　Mayor about the policy of welcoming foreign visitors, and town’s situation regarding the elderly. Lastly, the participants visited Chuson-ji temple and Motsu-ji temple, major cultural treasures of Hiraizumi, and had a briefing from the executive director of each temple, Rev. Chojun Kanno and Rev. Myokyu Fujisato. The participants asked about the difficulty of preserving the cultural heritage and how they felt just after the quake about the registration as a World Cultural Heritage.